Malloy addressing the MetroHartford Alliance. The future of Connecticut’s finances, transportation network and general well-being hinges largely on government — and the legislature in particular — reversing a long-standing culture of postponing hard choices, Gov. Dannel P. Malloy told Hartford area business leaders Friday. About to enter his final year in office, the governor also said one of his proudest-yet-most-painful accomplishments was funding pension obligations that many officials before him deferred and thereby magnified — at great expense. The Democratic governor is pressing the General Assembly to begin closing a $208 million budget deficit — and to bolster a state transportation program otherwise headed for major contraction, deficits and insolvency in the coming years. Malloy, who proposed a 30-year transportation rebuilding program in early 2015, said he has found plenty of legislators ready to discuss which transportation projects to fund. “That’s really fun, to say we’re going to spend more money” on transportation, he said. But beyond dedicating roughly 1/13th of all sales tax receipts to transportation — enough only to cover initial planning in the first few years of the program — lawmakers have been less enthusiastic about ordering tolls or otherwise raising money for the initiative. The administration warned Wall Street credit rating agencies earlier this month that — absent new funding — Connecticut would need to scrap some rail services, drive up fares, suspend 40 percent of planned capital projects and defer major highway rebuilds like the Hartford viaduct, over the next five years. The governor said he is particularly fearful about the financial services sector based in Fairfield County — for which Connecticut faces constant competition from New York’s Westchester County and northern New Jersey. The business community can play a crucial role, the governor said, provided it understands that — given Connecticut’s other fiscal challenges — transportation can’t be addressed unless new revenues are raised. “You’ve got to bring it over the line,” he told business leaders. State finances are projected to face increasing pressure over the next 15 years, and possibly longer, as required contributions to long-neglected retirement benefit programs surge dramatically. Malloy said he knew the new state budget “was out of balance before I signed it,” but did so nonetheless to end a debate that had dragged on for nine months — including four months into the new fiscal year. “We needed a budget,” he said. Legislators had crafted that bipartisan budget without the participation of the governor or his staff and passed it by veto-proof margin. It relies heavily on directives that Malloy find unprecedented savings in state spending after the budget is in force. The governor who already has begun to achieve those savings by ordering reductions in municipal aid, has drawn fire from lawmakers. Now the governor is frustrated because the General Assembly has scheduled a special session right after Christmas — but not to mitigate the deficit. That session instead will be used to redirect about $54 million in funding from not-yet-defined sections of the budget to reverse cuts to a popular social services program, which uses Medicaid funds to help the low-income elderly and disabled pay medical expenses that Medicare doesn’t cover. 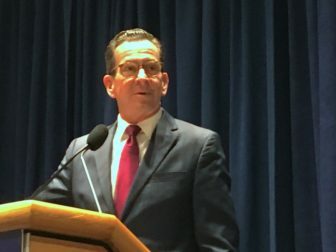 “We’ve demonstrated some level of discipline over the last seven years,” Malloy said, adding he is the first governor to make the full recommended contributions to all public-sector pension funds throughout his tenure. The governor and lawmakers did agree this past January to realign payments into the state employee pension fund over the next three decades. Those payments, while rising dramatically in the near future, will not do so as sharply as originally projected until the mid-2030s. Payments after that point will be higher than originally forecast. This was done to mitigate a projected spike in annual contributions from about $1.6 billion now to nearly $6.6 billion by 2032. This cost surge, and those in other retirement benefit programs, are projected because Connecticut largely failed to save properly for retirement benefits for most of the past eight decades. Malloy said he believes his administration significantly reformed the benefits that will be provided to future state employees and worked hard not to shift costs onto future generations.